Recently, we hosted a webinar that highlighted the latest features in the R3 2018 release of Kendo UI. This blog post provides a summary of the webinar and answers a few of the questions that were asked. As always, you can read an overview of the latest changes in the article, What’s New for Kendo UI. The webinar was hosted by Alyssa Nicoll, Carl Bergenhem, and me. Don’t worry if you didn’t get a chance to watch it live. We’ve posted it to our YouTube channel. In fact, you can watch it now! During the webinar, we asked attendees to ask questions and offered the Bose QuietComfort 35 II as a prize for the best one. The winner is Beau Tschirhart. Congratulations and thanks for your great questions! We’re using the (older) RadGrid controls. Is there anything that Kendo UI can’t do compared to these components that would prevent us from updating? The RadGrid for ASP.NET AJAX is pretty mature, so it depends on which Grid from Kendo UI you’re reviewing. Most of the pre-existing functionality is available in Kendo UI. However, there could be a feature (here or there) that isn’t available yet. If you want to chat about this potential migration, please feel free to reach out to Carl Bergenhem (PM for Kendo UI) directly: carl.bergenhem@progress.com. Do the different controls – Telerik UI for ASP.NET AJAX, Kendo UI for jQuery, Kendo UI for Angular, Kendo UI for React, Kendo UI for Vue – play well together if used together on the same page? Yes, they do! Kendo UI for jQuery, Angular, React, and Vue all share a common rendering with our Sass-based themes; you wouldn’t even have to do too much to make them blend together. Telerik UI for ASP.NET AJAX has “similar-ish” themes but would require some design work for these controls to blend a bit better with those in Kendo UI. Technology-wise, it wouldn’t be a problem though! Can we plug the new Kendo UI stuff in beside our (old) Rad stuff without breaking anything? Do the performance improvements target IE11? Why I am not getting the updated Angular contents in the site? Are you talking about on your personal site or on our docs page? It would be helpful if the docs included the version number the feature or function was released in. Great idea! Please submit your feedback: kendoui-feedback.telerik.com. Thanks! Does the notification component in Kendo UI for Angular support custom designs? Yes, you can add custom markup and Kendo UI components in the Notification component. Please refer to the section entitled, Render a Component, for more information about how to do this. Do you have plans for an infinite scroller in Kendo UI for Angular? If you need this outside of the virtualization that we offer in the Grid component – such as a generic, infinite scroller – please submit this idea to our feedback portal: Kendo UI for Angular Feedback. Kendo UI for Angular seems to be rolling out slowly. Some important components are still missing like Map, PivotGrid, etc. The roadmap for next release doesn’t have new additions. Could you please share your plans for Angular components? We’re keeping the Kendo UI for Angular roadmap up-to-date as we make progress. Components like the Map, PivotGrid, and others take some time to build. We’re building Kendo UI for Angular from the ground up. As such, it takes some time to get these components implemented. We’re in a good spot right now, especially with the Scheduler component just around the corner. However, it will take some time to implement the rest of the bigger components. Can filters (contains, eq, neq…) be uniquely set for every column in the MultiColumnComboBox? Currently, this is set across the entire component, but you define which fields should be included. So, if you set a contains filter, you could limit it to 2/5 columns. When will the MultiColumnComboBox be available for React? We are trying to build out the library as quickly as possible! If you’d like to see this component in React before some others definitely let us know on our feedback portal: Kendo UI for React Feedback. Is it possible to wrap the MultiColumnComboBox as a React component? Yes, it could take some work, but we could share some of the source code for our other React wrappers (they do exist!) that can be helpful when setting this up. What are the licensing terms for the components? Do you need to purchase a licence once you deploy your app? You can find this information on the Kendo UI website. Is the MultiColumnComboBox specific to desktop web? Or, does it also support the mobile web? It’s “supported-ish” if I can be honest. 😀 It’s challenging to figure out how to render a Grid component in a DropDownList in a small viewport. It can be interacted with on a mobile device, but there would need to be some updates from our side to make it ready for responsive web apps. What about Kendo UI and AngularJS? any updates? Can we use these React components for SharePoint Online projects? We have a website dedicated to providing information about building apps for SharePoint with Kendo UI: Office 365 and SharePoint. Please keep in mind that it targets jQuery but the same principles can apply to React. How does one migrate Kendo UI for jQuery to Kendo UI for Angular? That’s a very loaded question. Answer can vary a lot! 😀 I recommend approaching this challenge on a component-by-component basis. For example, create a view in Angular then add one of our components and try to match the feature set. It will require some work, but this is the best way to go. Plus, this approach lets you architect your app and work with our components in a manner that suits Angular. Is there any known differences in the scrolling performance of the Grid between jQuery, Angular, React, and Vue? It depends a little bit on the framework, but the overall performance should be the same. We’d be inclined to give the edge to Angular and React due to the frameworks themselves being better for partial updates. Have there been any improvements to exporting large sets of data from the Grid component to Excel? Yes, but there are still some limitations depending on the size of the dataset being exported. It might be worth offloading this to the server (since client-side exporting requires all data to be loaded on the client) using something like our Document Processing Library. Is there a plan to integrate Material Design Components (MDC) Web into Kendo UI? Rather than integrate MDC into Kendo UI, we’re taking the approach of augmenting your UI stack with Kendo UI. MDC and Kendo UI both follow Material Design, so you can use both side-by-side while having a common look-and-feel. This is possible with Angular and React. However, it’s a bit tricky to convert on the jQuery side. We’re still looking to see what we can do here though and will let you know if we are able to make this happen. I’d like to enhance every Kendo UI components’ Sass source code to output single RTL or LTR CSS compiled file, rather than to output both of them (RTL and LTR) in the same component’s css compiled file. I’ll take this note back to the engineering team to consider. Good idea! Is Kendo UI for Angular ever going to have parity with the Kendo UI for jQuery? The ultimate goal is to have feature parity, but it takes a while to build something from the ground up to match such a mature component set. Don’t forget: Kendo UI for jQuery has been around since 2011. That stated, if you are missing any components that you want to use let us know on the feedback portal: Kendo UI for Angular Feedback. Does Kendo UI for Vue use jQuery? Currently, yes. We wanted to launch this as something for Vue users to get in their hands today, but we want to move over to native in the future. Can’t say when the switch will happen, but we want to serve the Vue community just as well as we serve the communities for jQuery, Angular, and React! We did this for React and now we have the set of native components. Are you watching the progress on the Ivy renderer coming out soon for Angular? Yes, we totally are! Luckily, there’s a lot of information being shared by the Angular team to help us prep. In fact, we were one of the first vendors to blog about it: First Look: Angular Ivy. How can we get a hold of the new Angular bits? Are they available on npm yet? Yes. For example, the following command to add the Notification component to your Angular project: ng add @progress/kendo-angular-notification. You can find more information about Notification component online: Notification Overview. Why is Vue getting more steam on features than Angular? Two reasons why this seems to be the case: 1) it’s based on the jQuery components which makes us get a 2-for-1 kind of package there and 2) the Scheduler is a pretty big component so it takes time to get the underlying engine written! The Notification component is alright, but it feels limited that the only anchor is the viewport. We’ll definitely continue to add features, so if we could add in something that makes it more usable let us know either via a support ticket or on the feedback portal: Kendo UI for Angular Feedback. Will you be migrating all demos from the Kendo UI Dojo and Plunkr over to StackBlitz? We’re currently using the Kendo UI Dojo for the demos targeting Kendo UI for jQuery. However, StackBlitz has been serving us very well for the demos we’ve built for Angular and React. Can you use Kendo UI to debug React issues? I’m not sure how that would work. However, Kendo UI for React works perfectly fine with the React tooling in Chrome DevTools, for example. Are the Angular and React implementations are based on the jQuery code base? Or, are they entirely new code? Hopefully, you heard my answer live, but just in case: Angular and React implementations are 100% native and have zero dependencies. When we export around 50K records to Excel, we get an error in Chrome. Why is that? Is there another way to export such as larger volume of data in Chrome? Large amounts of data can be difficult to accommodate on the client-side. It might be better to offload this work to the server-side. The tricky part with exporting this amount of data is that you have to load all of these items on the client and then create the Excel file. I would recommend checking out our Document Processing Library to see if that could help. As always, a big-time THANK YOU to everyone who joined us for the webinar, and for all the great feedback. 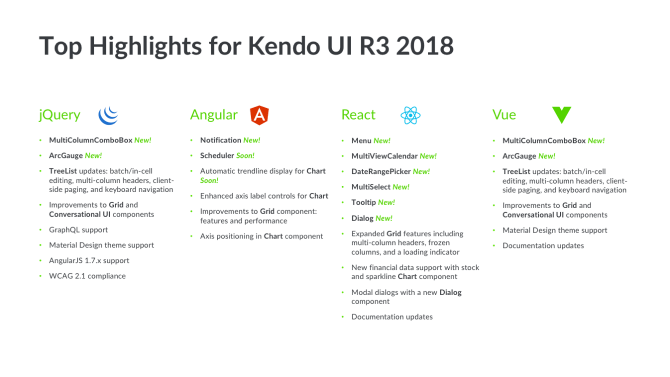 We hope all you’ll love the new features and improvements we’ve made to Kendo UI in the R3 2018 release. In the meantime, please feel free to leave your thoughts at our Feedback Portal or in the comments below. The R3 2018 Release for Kendo UI is Here!